Solar hot water is not a one size fits all solution. Just like other home upgrades, there are some decisions you’ll need to make before you make a final choice about your solar hot water installation. From specific equipment decisions to warranties, knowing what to look for in quotes from solar hot water installers can save you money and make sure you have the right system for your home. What size solar hot water system do you want for your home? Do you want an active or passive solar hot water system? If you choose an active solar hot water system, do you want it to use direct or indirect heating? To figure out what size system you should install, you’ll need to decide how much of your hot water use you want to cover with solar. In most cases, you won’t be able to find a system that covers all of your hot water use 100% of the time. If you are willing to invest slightly more money upfront to have a larger setup with more collectors or a larger storage tank, a higher capacity system might be for you. Conversely, if you want to supplement your daily use with some solar-powered hot water, you can opt for a system with one or two collectors. What is a solar collector? A solar collector is a panel that captures heat energy from the sun, which is used to heat your water. 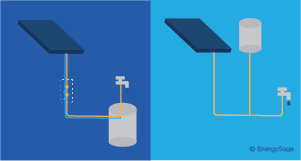 Solar collectors are usually mounted on your roof, and either have water running directly through them (direct system), or a transfer fluid that moves heat energy to your storage tank (indirect system). Active and passive solar hot water systems are differentiated by how water moves throughout the system. An active solar hot water system has an electric circulation pump that moves water through the system’s tubing. Active systems cost slightly more money, and are more complex to operate, but but the presence of a pump means you can operate your solar hot water system for the full year, even when it gets cold outside. As a result, they offer a higher efficiency than passive systems. For the majority of U.S. shoppers, an active system will save you more money on your water heating bill in the long run. Passive solar hot water, on the other hand, has no pump to move water. Instead, these systems rely on convection and the tendency of warmer water to rise. The collector panels for passive systems need to sit high up, and usually will need to be supported by your roof. For older homes or properties with roofs that cannot support a lot of weight, a passive system will not get the job done. They do tend to be slightly less expensive than active systems, but they aren’t suited for properties in regions with cold weather. If you, like the majority of system owners in the United States, choose to install an active solar hot water system, you’ll need to decide between a direct and indirect setup. Direct systems heat water right from the sun, while indirect systems use a different fluid to transfer heat from your collectors before heating your water. A direct solar hot water system cycles potable water through your collectors, where it is heated by the sun and moves throughout your home. Direct solar hot water systems work well in warm climates because heated water moving through pipes has less of a chance to lose energy when surrounded by warm air. In an indirect system, a transfer fluid similar to antifreeze is cycled through the tubing in your collectors, capturing heat and eventually running through a heat exchanger inside your storage tank, where the captured heat is released to heat up water in your tank. These systems tend to be more successful in the U.S. because they are more resistant to cold weather, as water is stored inside in a storage tank rather than waiting in tubing to be cycled through your home. What type of solar collectors do you want in your system? 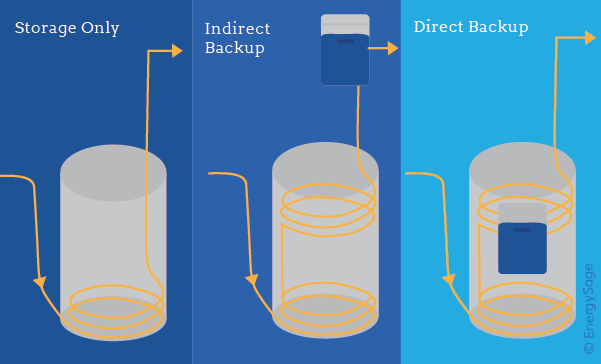 Will you install a storage-only tank, indirect backup system, or direct backup system? You have two options when it comes to solar collectors: flat plate collectors and evacuated tube collectors. Flat plate collectors are a commonly used solar hot water technology, and have been in use for decades. They are made of an absorber plate bonded to pipes inside the panel. Absorber plates are usually made from a sheet of copper or aluminum that is painted or chemically etched black for maximum energy absorption. Their main advantage over evacuated tube models is price – flat plate collectors are generally less expensive than evacuated tube collectors. They don’t perform well in cold weather, making them best for homeowners in southern climates. Evacuated tube collectors are a newer innovation for the solar hot water industry, and improve on many aspects of flat plate collectors by surrounding the absorber plate with glass tubing. The vacuum inside the glass tubes acts as a powerful insulator, making evacuated tube technology perform better than flat plate collectors in colder weather. They also collect heat more evenly throughout the day, and heat water to a higher temperature. In general, flat plate collectors and evacuated tube collectors can be compared in a similar way to polycrystalline and monocrystalline solar panels. 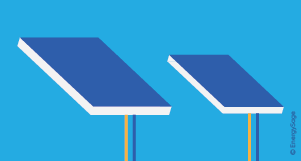 Like polycrystalline solar panels, flat plate collectors are less expensive, but less efficient. Evacuated tube collectors, like monocrystalline solar panels, are more expensive up front, but will save more money in the long run due to their higher efficiency. You have three main options when it comes to the type of storage tank and backup system you install: storage-only tanks, indirect backup systems, and direct backup systems. Simply put, storage-only systems have a single tank with a heat exchanger for solar hot water, and are usually installed alongside a backup water system with a separate tank. This type of installation is best suited for homeowners who have a functional hot water system already that can act as a backup, but want to add on a solar hot water element while keeping installation costs low. Direct backup systems have your backup heat generation of choice built directly into the tank, allowing you to consolidate all of your hot water into one single storage unit, similar to an indirect system. They have two heat exchangers within the tank (one on the bottom and towards the top), and when solar radiation isn’t supplying enough heat energy, the built-in backup hot water source kicks in to supplement solar energy. Direct backup systems are great for homeowners looking to save space and completely redesign their hot water setup, as they only require one tank unit. Indirect backup systems have two heat exchangers as well, one for solar energy and one for backup generation. The exchanger linked to backup generation can introduce heat from a source like a boiler, making indirect systems popular for property owners who already use a boiler for space heating. The material your storage tank is made from can also make a difference. The most common tank material is glass-coated or enamel-coated steel, but you can opt for stainless steel or stone-lined tanks as well. Coated steel tanks are the most economical, but don’t have high durability over time. Stainless steel tanks come with a longer warranty and weigh less, but cost significantly more than coated steel options. Stone-lined tanks have longer lifetimes than other models, but weigh more than coated steel tanks, potentially increasing shipping costs. Just like solar photovoltaic products, solar hot water components have warranties associated with them. Make sure to understand your warranty terms before installing any solar hot water system. Higher quality solar hot water options typically come with a warranty to match. Most warranties will cover repairs or replacements for defective parts, but always double check to verify what’s covered by the manufacturer and your installer.